You really can't beat that evocative, fresh pine fragrance that a real Christmas Tree brings to the home - artificial trees just don't have the same effect! Just imagine being cozied up next to your tree on a cold winter evening, warm and surrounded by the glorious scent of Christmas. Abies nordmanniana, the Nordmann Pine is the hugely popular non-needle drop variety, and rapidly becoming a traditional favourite. One of the most popular Christmas trees, the Nordmann Pine has soft dark green needles and low needle drop - so they're really easy to handle and move around - you don't have to worry about a face full of prickly needles as you decorate your tree! This in itself is one of the most satisfying moments over the Christmas period, and with the natural lines of a real tree, making that final decision on where to put that last decoration really shows your Christmas prowess - decorate like the boss you know you are! Full, lush and shapely, there is nothing better than a real Christmas Tree at Christmas time, where it will fill your home with gorgeous colour and pine-scented aroma - and did you know that the scent of pine can have a positive effect on your mood, reducing anxiety and stress? Also, from an environmental angle, real trees are the way to go. According to the Carbon Trust, a real Christmas tree has a significantly lower carbon footprint than an artificial tree, especially if it is disposed of properly, by chipping or burning. Easy to care for, you can keep your tree in tip-top condition by placing it in a stand with a water reservoir and adding water regularly. Also keep it away from heat sources such as fires and radiators. We supply a 8-10 year old cut tree, 1.2m in height, netted and ready for you to decorate your home. Please note that your tree will need a stand which is not supplied with this item. After unpacking your tree, if you can, saw off a few cm (1-2 in) from the bottom of the trunk - this will help the tree to take up water. 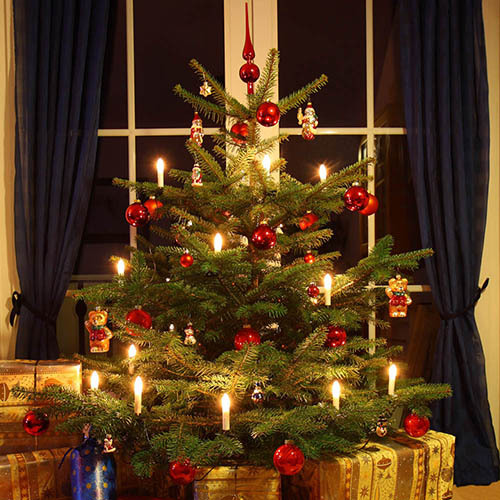 Cut Christmas trees are like cut flowers, they remain fresh for a time by taking up water. As soon as it's cut, place the tree into a tree stand with a water resevoir and top it up regularly. If you're not putting your tree up immediately, store it in a cool but frost-free place. When putting your tree up, place it in a cool spot, ideally away from direct sunlight or any sources of heat such as radiators. Keep the water topped up - trees can use up to 1-2 litres (2-3 pints) of water a day.